Worship in Women's Hands » DVD Available!! DVD now available! Order your copy today. 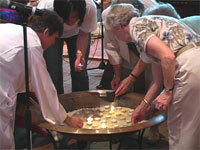 The DVD features the 28 minute documentary Worship in Women’s Hands as well as the complete liturgy celebrating the life of Hildegard of Bingen. The Hildegard liturgy also appears as a chapter in Teresa Berger’s most recent book Fragments of Real Presence (2005). Click here to play video excerpt. Susan Roll, Associate Professor of Liturgy, Faculty of Theology, Saint Paul University, Ottawa, Ontario, Canada, and Director of the Centre for Women and Christian Traditions at Saint Paul.